A source of silicon for your plants. 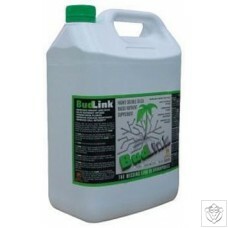 BudLink is a highly soluble silica based nutrient supplement. The use of BudLink will increase weight and bulk, assist nutrient uptake as well as strengthening plants and improving disease resistance. - Reduces moisture loss - More efficient uptake of nutrients - Improved cell development - Stimulates plants immune system - Increased weight and bulk. ..